We regard the enclosures where we spend Sukkos as, well, sukkos. And they are, of course; the walls comprise a necessary part of a sukkah. But it’s their roofs – the bamboo poles or mats woven for the purpose from slivers of the same material, or branches or leaves or thin, unfinished wooden slats – that give the structures their name. The roofs, that is, made from vegetation once-alive but now detached from the earth it needs to grow: s’chach. But there is another meaning to that Loshon HaKodesh word, as various sefarim note, namely “to see” or “to perceive.” That association would seem to imply that a sukkah somehow provides some special perspective. And, of course, it does. On even the most mundane plane, living in a small rudimentary hut for a week, within sight of, yet apart from, one’s more comfortable, more spacious home, does afford a different point of view. Like about our vulnerability, and reliance on Hashem’s everlasting rachamim. While our sturdy houses may be nearby, and if it rains hard enough we can – indeed should – return to surer shelter, our exposure to the elements in the sukkah, if we only care to ponder it, just magnifies our exposure to all sorts of threats, even in our “secure” abodes. Not only are those abodes subject to other natural disasters – which we may not often think about, but should all the same, even if we don’t live in earthquake or flood zones – but there are dangers lurking wherever we are. Bad drivers and bad people, obstacles to trip over and germs with the potential to lay waste to our good health… That is part of the perspective granted the thoughtful sukkah-dweller. But there is more. What the sukkah allows us to perceive, if we try, is that our homes and their contents are not us. That is to say, our possessions don’t really matter. The mindless man in a fancy car with the bumper sticker reading “The one who dies with the most toys wins” reflects a mainstream conviction, but it’s as far from Jewish belief as east is from west. Sitting in our primitive week-house, we come to know that what we have accumulated is simply not essential. In fact, no matter how much it may have cost us, in the end, it’s meaningless fluff. Which is why Sukkos is zman simchaseinu. No, I’m not being facetious. The happiness that is the theme of Sukkos and to which we make much reference in our tefillos on the holiday not only is not antithetical to our “deprivation”; it is born of it. That’s because attaining true happiness begins with realizing what, despite its promise, doesn’t really make us happy. The “high” afforded by a new possessions dissipates quickly. The moment one first drives a new car, it becomes a used one. What’s more, possessions only beget the desire, even the need, for yet more of the same, a truth that has come to be called the “hedonic treadmill” – “hedonic” meaning “pertaining to pleasure.” The treadmill mashal conveys the fact that the pursuit of happiness is like a person on a platform moving in the opposite direction, who has to keep walking just to stay in the same place. A person may achieve wealth, in other words, but his expectations and longings only rise in tandem. There’s no permanent net gain in happiness. Chazal, of course, said it pithily: “He who has a hundred wants two hundred” (Koheles Rabbah 1:34). And, as Chazal also said in many instances, pok chazi – “go out and look around.” At all the possession-endowed, that is, here: the entertainers, sports figures, best-selling authors, the old-moneyed and the lottery-winners. They may zip around in Lamborghinis and check the time on Rolexes, but is their happiness quotient necessarily greater than that of those who take the bus and keep time with a $5 watch? Are their grand estates more of a home than the simplest, cozy cottage? A cogent case could be made that the precise opposite is true. In the end, dependency on having stuff is what keeps us from being truly happy. Because authentic joy comes from things unavailable from Amazon.com. Like our relationships with our parents and children and friends, and with our community. And, ultimately, with Hakadosh Baruch Hu. So the sukkah is indeed a source of “sight,” or, perhaps better, insight. It opens our eyes, letting us better see that, ultimately, what we really have is not what we own, but what we are. And, fully comprehended, that is the true path to simchah. This entry was posted in Holidays, Jewish Thought, Sukkos on September 21, 2018 by Rabbi Avi Shafran. An article I wrote about poverty and plenty in the Orthodox Jewish world appears in the Forward, and can be read here. This entry was posted in Jewish Thought, Personal Reflections, Sukkos on October 10, 2017 by Rabbi Avi Shafran. 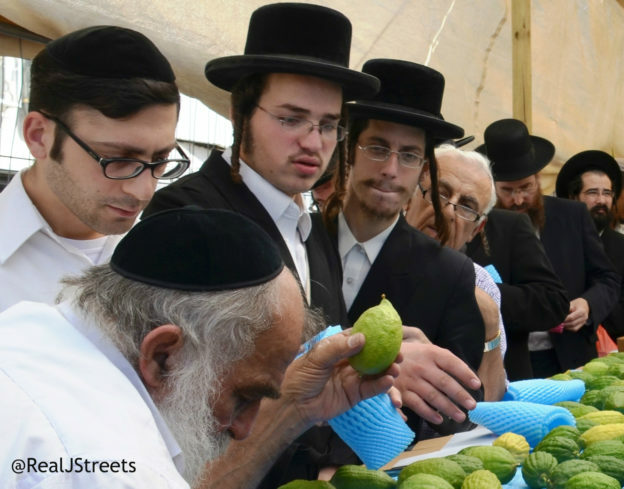 On the first day of Sukkos, after tens of thousands of Jews had paid princely sums for flawless specimens of a particular citrus fruit, payments were made by others, too, for a very different reason. That day, the Smithsonian Institution’s National Museum of American History launched a public campaign to raise $300,000 in order to restore and preserve a pair of slippers, those that were worn by the main character in the 1939 film production of a children’s classic. “The shoes,” explained the Smithsonian, “are fragile and actively deteriorating.” Their color, appallingly, “has faded, and the slippers appear dull and washed-out. 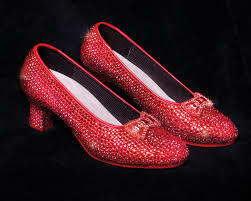 The coating on the sequins that give the shoes their hallmark ruby color is flaking off its gelatin base. Some threads that hold sequins in place have broken.” Something had to be done. The campaign, which aimed at repairing the footgear and constructing a special temperature-controlled and light-controlled enclosed environment to ensure that the slippers last into perpetuity, was intended to span three weeks. By Shemini Atzeres, though, it had already exceeded its goal, and donations continue to pour in. Support came from 41 countries, with the highest concentration of donors in New York, Los Angeles and Washington, D.C. And likely the fictional town of Chelm. To paraphrase the prayer recited by mesaymim, “We expend funds and they expend funds.” And what an intriguing contrast the respective mass expenditures provide. “Conserving an American Icon” is what the Smithsonian dubbed its save-our-slippers movement. “Icon” is a word borrowed from the Greek, and can mean “idol.” Whether the good-heartedly nostalgic donors to the Keren HaSlippers, for their adoration of physical objects, can be categorized as idolaters is not something I am prepared to say, or qualified to judge. But such simpleminded devotion can prove something of, if an irresistible pun can be forgiven… a slippery slope. After Yom Tov, of course, many esrogim were either consumed fresh or, processed, as jelly. Others were just put aside to petrify. While the fruits were immensely valued for seven days, they had an expiration date, so to speak, one unrelated to their freshness. And that speaks to the essential difference between how a Jew looks at an esrog and how a sentimental soul sees a theatrical relic. The esrog is a means of performing a mitzvah, not an inherent object of adulation. It is valuable for the opportunity it provides to serve Hashem, a means toward a goal, not something to be venerated. And so, once its purpose as a path toward the performance of a mitzvah has been fulfilled, it reverts to a mere fruit. To be sure, there are objects in our own world that possess inherent holiness, like kodoshim, meat or flour-offerings from korbanos brought in the Beis Hamikdash; or, today, a sefer Torah. But kodoshim is, in the end, consumed or burned, and a sefer Torah’s holiness derives from the words it contains, not from ink and parchment themselves; and when it is no longer usable, it is buried. There are, moreover, Jews who treasure objects that were once used by great tzaddikim. But only, at least properly, because of the objects’ connection to those tzaddikim, who were in fact worthy of veneration because of the lives they lived. Rather different, to greatly understate things, from an artifact of a theatrical production. Non-Jews, and Jews unfamiliar with their spiritual heritage, if aware of the prices paid by observant Jews for esrogim, must think us strange. After all, the most beautiful, symmetrical, aromatic lemon in the Trader Joe’s bin commands at most fifty cents. And it has a nice, smooth skin, too. And if they knew of all the other substantial expenditures we make, for talmud Torah, for Shabbosos and Yamim Tovim (for Pesach alone! ), for kosher meat, for tzeddaka… they would surely think us entirely unhinged. They, though, don’t comprehend what a mitzvah means to a heartfelt Jew. If only they could truly appreciate the meaning of a mitzvah, they would perceive the deep contrast between cherishing a meaningless prop and valuing a precious objet d’mitzvah. If they only, so to speak, had a bren. A set of footwear was confirmed in the status of an icon, and a large sum was dedicated to its preservation – at least in the hopes of curators and now grown-up children – for eternity. And a mitzvah was, as every year, performed at considerable expense by Jews, affording them actual access to eternity. This entry was posted in Jewish Thought, News, Sukkos on November 11, 2016 by Rabbi Avi Shafran. There is simply no describing the plaintive, moving melody to which Yiddish writer Avraham Reisen’s poem was set. As a song, it is familiar to many of us who know it thanks to immigrant parents or grandparents. And, remarkably, the strains of “A Sukkeleh,” no matter how often we may have heard them, still tend to choke us up. Based on Reisen’s “In Sukkeh,” the song, really concerns two sukkos, one literal, the other metaphorical, and the poem, though it was written at the beginning of the last century, is still tender, profound and timely. Lovingly I stood them upright. I sit in my sukkaleh at night. The candles, they flicker and yearn. The flames, calmed, now quietly burn. Worry on her face like a pall. The sukkah’s fine; banish your fright. Yet the little sukkah still stands upright. And yet, at least seen superficially, there seems little Jewish joy to be had these days. “State actors” openly threaten acheinu bnei Yisrael in Eretz Yisrael. Enemies bent on killing Jews attack them, there and elsewhere in the world. Here in America, an ugly current of anti-Semitism emerges at times to remind us that it thrives in the dirt underfoot. The internal adversaries of intermarriage and assimilation continue to intensify and take their terrible toll. The poet, however, well captured a Sukkos-truth. With temperatures dropping and winter’s gloom not a great distance away, our sukkah-dwelling is indeed a quiet but powerful statement: We are secure because our ultimate protection, as a people if not necessarily as individuals, is assured. And our security is sourced in nothing so flimsy as a fortified edifice; it is protection provided us by Hakodosh Boruch Hu Himself, in the merit of our avos, and of our own emulation of their dedication to the Divine. And so, no matter how loudly the winds may howl, no matter how vulnerable our physical fortresses may be, we give harbor to neither despair nor insecurity. Instead, we redouble our recognition that, in the end, Hashem is in charge, that all is in His hands. And that, as it has for millennia, the sukkah continues to stand. This entry was posted in Anti-Semitism, Holidays, Jewish Thought, Sukkos on October 14, 2016 by Rabbi Avi Shafran. With hurricane season upon us, we might learn something from the models that meteorologists offer when a large sea-storm heads for land. Something about Shemini Atzeres. The maps created as a storm approaches often include colored lines indicating the projected paths of the hurricane as predicted by different models, each based on its own sets of data and methodology. The combined yield looks suspiciously like, though not as appetizing as, spaghetti. Only one model (if even that) will end up “winning” the prediction contest. And, as likely as not, the next storm around, a different model, based on different calculations, will emerge as the retroactively prophetic one. “Cause and effect” is a basic principle of modern science. By observing what seems to make happenings happen, we can predict, at least theoretically and if in possession of sufficient information, almost anything. Weather forecasting, despite mountains of data gleaned from satellites, weather stations and previous storms, cannot even generally predict a storm’s movement or intensity beyond a day or two. That might be attributed to the sheer amount of information needed to make a weather forecast, and the complexity of combining all the necessary elements. There is what has whimsically been called the “Butterfly Effect” (and more soberly, “sensitive dependence on initial conditions”) – the idea that even something like the flapping of a butterfly’s wings in Asia might have an effect on the course of a storm in the Carolinas. But something deeper and more subtle is at work, too. An accepted idea in modern physics, Heisenberg’s Uncertainty Principle, has it that at the most fundamental strata of physical matter, there is a limit to what can be known. The more precisely the position of a particle is determined, the less precisely its momentum can be known, and vice versa. So there is an inherent element of unknowableness (well, there should be such a word) in the matter comprising the universe. What we call nature, in other words, isn’t truly predictable, or even “natural.” Nature is just the word we use to describe miracles we’ve come to take for granted. Consider the weird world Rav Eliyahu Eliezer Dessler, zt”l, asks us to imagine, where the deceased routinely arise from their graves rejuvenated, but grain and vegetation do not exist. In the thought experiment, a man appears holding a seed, something never seen before in this strange place. He loosens some soil and places the tiny kernel into the ground. The locals wonder at the oddity –why is he burying a pebble? – and are astonished when, several days later, a green sprout pierces the soil where the seed had been consigned. When it develops into a full-fledged plant, even – most shocking of all – bearing seeds of its own, the onlookers are flabbergasted. Techiyas hameisim will be similarly amazing to those who will witness it, observes Rav Dessler. What is more, in our world, a seed’s growth is itself no less a miracle, willed from above. The numerical equivalent of the word “hateva,” – “the [realm of] nature” –sefarim hakedoshim note, equals Elokim. The miraculous, in other words, is ubiquitous, even if the phantom of predictability lessens our appreciation of it. Weather, though, with its fickleness, reminds us of what we easily forget: that uncertainty is the real rule, underlying even the very building blocks of matter. 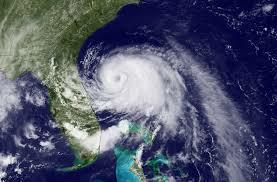 In fact, the Hebrew word for “rain,” geshem, means “physical matter” as well. There is a human entity, too, that eludes predictability. Empires and nations rise and fall, never to rise again. Populations are exiled from their lands and never return. Those are “natural” rules of history. You know the exception. In the time of the Beis Hamikdash, on Shemini Atzeres, the “Eighth Day Festival,” after the Sukkos offerings of 70 parim representing the nations of the world, a single par, representing a singular nation, was offered. That, on the day when we remind ourselves that there really isn’t any independent entity called “nature” – focusing on the wonder that is Klal Yisrael, and, in Tefillas Geshem, on the wonder that is rain. This entry was posted in Holidays, Jewish Thought, Sukkos on October 14, 2016 by Rabbi Avi Shafran. 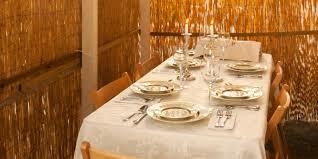 Each year, sitting in the sukkah on the first night of Sukkos, with my wife and whoever among our children and grandchildren we are fortunate to have with us for Yom Tov, I feel a particularly intense elation. Part of it, no doubt, is the result of having managed to erect the sukkah on time. But most of it is born, simply but powerfully, of having so many family members around the table. For many years, though, ironically, my joy also bothered me. After all, I reasoned, simchas Yom Tov, the happiness we are commanded to feel on a holiday – particularly on Sukkos, “the time of our happiness,” is meant to be, well, simchas Yom Tov, not delight in one’s family. But then, one year, I reached a more refined understanding of simchas Yom Tov. And I’ve never thought about it quite the same since. The first hint that there was something here to discover lay in Chazal’s description of how we are to fulfill simchas Yom Tov. The Rambam (Hilchos Shvisas Yom Tov, 6:18), basing his words on the Gemara (Pesachim 109a), instructs a man to buy his wife new clothing and jewelry, to give his young children nosherai and to himself enjoy meat and wine. (Before splurging on that special Cabernet, though, bear in mind the Kaf Hachaim’s admonition that precedence here should be given to one’s wife’s pleasure.) So it’s clear that simchas Yom Tov is defined as taking joy in plainly physical pleasures. What gives? A striking Midrash (cited by Rashi) on a chapter of Tehillim we recite twice daily this time of year, elucidates the passuk “For my father and mother have abandoned me, and Hashem has gathered me in” (27:10). Dovid Hamelech, says the Midrash, was stating that his parents’ focus was on their personal relationship; it was about themselves, not him. In that sense, explains the Midrash, they “abandoned” him. But stop and think a moment. Dovid’s father was Yishai – one of the three personages who Chazal tell us (Shabbos 55b) “died by the counsel of the nachash,” the serpent in Gan Eden. In other words, he was personally without sin. And yet he is being described as, in some way, selfish? What occurs is that there is an inescapable aspect of self-awareness (the result, likely, of the nachash’s “success” in Gan Eden) and self-concern that is part and parcel of being human. To lack it is to be an angel. Or, perhaps better, a mere angel. Angels, after all, Chazal tell us, are static; humans, dynamic. Even the most sublime of human beings have selves. Even the ideal talmid chacham, represented by the Aron in the Mishkan, who is “gold” within and “gold” without, still has a core of wood – a symbol, it may well be, of the Eitz Hadaas, which bequeathed self-awareness in the first place. And if a sense of self is an inherent part of being a human being, experiencing physical or emotional pleasure at times is normal and inevitable. What the Chinuch may be telling us is that simchas Yom Tov means acknowledging that reality, embracing the pleasure of the harvest – and the joy born of the new clothing and the wine and the meat – but “grafting” it onto the spiritual, conscripting it toward the service of Hashem. By doing that, we elevate the self. We turn the things that make our “selves” happy toward the holy. What happier moment could be imagined than when Yaakov Avinu was reunited with Yosef after 22 years of not knowing what had become of his beloved son. The Midrash, brought by Rashi, has Yaakov reciting Shema at that moment. Was he not overjoyed at the reunion? Of course he was. But he saw fit to graft his joy onto kabbalas ol malchus Shamayim. So we should enjoy our meat and our wine, our wives and daughters their new clothes and jewelry, our young’uns their nosh. And we should all consciously try to channel our enjoyment toward its Source. This entry was posted in Holidays, Jewish Thought, Sukkos on September 25, 2015 by Rabbi Avi Shafran. Olivewood is beautiful. It reminds me of Eretz Yisrael and little carved camels; it has a delicate, calming hue. And silver, well, it is pure and shiny and smooth, and brings sefer Torah ornaments to mind. The esrog boxes made of ornately carved olivewood and elegant, glimmering silver are most fitting containers for holding an objet d’mitzvah. My personal preference, though, is cardboard. Not any cardboard, that is, but my cardboard, the white heavy-paper stock box in which an esrog of mine, many years ago, was packed when I bought it. These days, the standard-issue boxes tend toward illustrated green affairs. The old-fashioned white ones were more bland, but also better canvases on which a child’s imagination could assert itself. And so my old esrog box—or at least its panels, re-attached now to a more sturdy modern box, covering up the garish green—is unique. Its sides and top feature a young child’s rendering in colored markers of, respectively, an esrog and lulav; a sukkah; a smiley-face;and (inexplicably but endearingly) a turtle whose shell is a sukkah covered with schach). The artists are now either mothers or “in shidduchim,” but some of us like, on occasion, to time-travel. We look at our grown children and see five-year-olds where they stand. The artwork was beloved to me many years ago when it was created; it’s no less beloved to me now. And so, in my own personal ritual, I yearly unpack my new esrog from its sale-box and delicately place it in the one whose panels have enclosed each of my esrogim over nearly twenty years. It’s not olivewood, and not silver. Not even gold or platinum. It’s more precious than that. I admit I get some stares in shul. Some may think I’m a cheapskate, unwilling to shell out a few dollars for what they think would be a more respectable container for a holy object, or insufficiently aware of the importance of hiddur mitzvah, the ideal of “beautifying a commandment.” Others, though—at least I like to imagine—understand the ethereal beauty of my unusual esrog-box, and perhaps are brought to some memories of their own, and even to some thoughts appropriate to Sukkos. The word sukkah, sefarim note, can be seen as rooted in “socheh”—“to see” or “to perceive.” A sukkah, it seems, can afford us a deeper perspective on life. Most people—and Jews are people too—go through life trying to “get stuff.” What storehouses of gold and silver once conferred on their owners is today bestowed by new-model cars and luxurious homes built on the ruins of less luxurious predecessors. But stuff is stuff. And even those of us who buy used vehicles and live in modest homes are far from immune to the “get stuff” societal imperative. We may apply it differently, limited as we are by reality. But we still feel the push to add to the inventories we’ll never take with us. When we sit in our primitive week-house, though, outside the homes that harbor so many of our possessions, we may find it easier to realize that our accumulations are not essential. We can exist without them. They do not define us. They will one day be left behind for good. True joy comes from things more rarified than what can be purchased. It comes from our relationships not with things, but with people—our parents and our children, our teachers and our students, our friends and our neighbors. What we really have in life is not what we own, but what we are. Some who have seen me walking to shul on yomtov with my reconstituted cardboard esrog box proudly in hand may have wondered why I hadn’t opted for a hiddur mitzvah. What they failed to comprehend is that I did. This entry was posted in Holidays, Personal Reflections, Sukkos on September 16, 2012 by Rabbi Avi Shafran. Were our eyes permitted to perceive the legions of destructive demons surrounding us, the Talmud divulges (Berachos 6a), we would be unable to handle the sight. The rabbis were referring to malevolent incorporeal beings, but the same might hold true about flesh-and-blood demons, some of whom occasionally slip into view. Like Faisal Shahzad, the Connecticut man who tried to detonate a bomb in Times Square in May. Or Umar Farouk Abdulmutallab, the one-time London college student who attempted to detonate plastic explosives hidden in his underwear on a plane to Detroit. Or Colorado resident Najibullah Zazi, who planned to plant incendiary chemicals on New York City subways last year. Or Virginia-born Army psychiatrist Nidal Hasan, who opened fire at Fort Hood last November, killing 13 and wounding 30. Or Shirwa Ahmed, the college student from Minneapolis who drove a truck full of explosives into a UN building in Somalia, who was identified through his finger found at the scene. Or the four men accused of plotting to bomb synagogues in the Bronx. Imagine if we could suddenly see every would-be terrorist, brightly marked somehow as such. The sight would surely chase us off the street, if not out of our minds; the memory would keep us up at night. And then, of course, there are the big demons, the mullahcracy in Iran or the dementocracy of North Korea, and entities like Hamas and Hezbollah and Al Qaeda. The readily visible demonisphere, especially for Jews, is frightening enough. The thought of an invisible world of would-be destroyers skulking around to our rights and our lefts might well drive us mad. Yet it would be naïve to imagine any dearth of demons these days. Which is why there is Sukkos. If they haven’t appeared already, impermanent structures of varied materials, shapes and sizes will soon enough be sprouting like post-rain mushrooms across Israel and throughout Jewish neighborhoods in cities around the world. The holiday of Sukkos takes its name from those structures, which Jews are enjoined by the Torah to inhabit for a week each year. The walls of sukkot can be made of any material. But, in fulfillment of Jewish tradition’s insistence that the dwellings be “temporary” in nature, their roofs must consist of pieces of unprocessed wood or vegetation, and the material may not be fastened in place. At first glance, living in sukkot – by definition vulnerable to wind, rain and pests – would seem only to compound any innate Jewish proclivity to worry; the delicate dwellings might well only intensify Jewish anxiety. And yet, at least for Jews who appreciate the holiday’s import, just the opposite is true. For Jewish tradition considers the sukkah symbolic of the divine “clouds of glory” that protected the ancestors of today’s Jews as they wandered in the desert after leaving Egypt. The miraculous clouds destroyed whatever obstacles or noxious creatures stood in the people’s path. Thus, the sukkah represents a deep Jewish truth: Security is not a function of fortresses; it is a gift granted, ultimately, from above. Sukkos, of course, have in fact succumbed to storms. Jews, too, have fallen at the hands of ancient and modern murderers alike. But, as Reisen’s metaphor so poignantly reminds us, there is timeless meaning in the fact that the Jewish people has survived. And the meaning lies in what the sukkah’s fragility implies – that true security, in the end, comes from only one place. So all the world’s craziness and evil, all the unreason and hatred and plotting and violence and demons, cannot shake the serenity of the sukkah. We have, if only we merit it, an impenetrable shelter. This entry was posted in Anti-Semitism, Holidays, Sukkos on October 11, 2010 by Rabbi Avi Shafran. Oddly, a Hebrew phrase familiar to the Jewishly-educated is routinely used to refer to two entirely different and seemingly unrelated things. The phrase is “Yud Gimmel Middos” – literally, “13 Measures” – and one of its usages was prominent over the days from before Rosh Hashana through Yom Kippur. In that context, the phrase refers to the verses from Shemos (34:6-7) that begin with G-d’s name stated twice (with a pause signaled between them, representing, the Talmud says, one’s different relationship to G-d “before he has sinned and after he has sinned and repented”) and comprising in all a list of thirteen aspects (or, as commonly rendered, “attributes”) of His mercy. The verses form the centerpiece of the Selichos supplications recited throughout the High Holidays season and are prominent in the Yom Kippur services, including its concluding prayer Ne’ila. The “13 Middos” of mercy thus reflect Hashem’s compassion and love. The other “13 Middos” refers to a list recited daily before the actual start of the first portion of morning prayers, at the conclusion of what is popularly referred to as the “Karbonos” portion of the traditional liturgy. This list, cited in Rabbi Yishmael’s name in the Sifri, a Midrash of halachic material, enumerates the “hermeneutical” rules by which Jewish laws are derived from the Torah’s verses. Some of that methodology, more completely known as the “13 Middos Through Which the Torah is Interpreted,” is logical, some of it not obviously so; all of it comprises a sacred part of the Oral Law itself. That both the expressions of Hashem’s mercy and the hermeneutical principles number thirteen, and that both are described as “middos” is intriguing. And it may be meaningful too. Everyone who has ever thought of G-d, certainly in the context of Judaism, has probably paused at the fact that, at least from human perspective, the Creator seems to present two different “faces.” On the one hand, He is the Merciful, the life-Giver, the Forgiver of sins and Bestower of blessings. And, on the other, He is the Lawgiver, instilling the laws of nature in the universe, and charging humanity with the foundational “Noachide” laws – and the Jews, with the laws of the Torah. Christianity seized on that seeming dichotomy, choosing to emphasize G-d as Merciful and, to one or another degree, to “downgrade” G-d as Lawgiver. Circumcision and most other Jewish laws were abandoned by the early Church and, later, Thomas Aquinas expressly judged the Torah’s “ceremonial and judicial” laws to be no longer binding. But even some Jews who would never think to affirm Christian theology have subtly come to effectively accept that bifurcation, laying claim to Hashem’s love but regarding His law, with all its complexity and detail, as off-putting and passé. However difficult the idea may be for them to internalize, though, the same G-d is the Source of both love and demand. The opening words of a prayer recited throughout the Days of Repentance say it clearly: Hashem is “Avinu Malkeinu” (“Our Father, Our King”) – both a merciful Parent and a demanding Sovereign. Perhaps that is the subtle implication of the strange fact of the two “13 Middos” – that the Source of mercy and patience is the very same Source of law and obligation. Indeed, that Divine mercy and Divine law are inseparable facets of the same Unity. The demands of Divine law are born of Divine love; they reflect G-d’s concern for our own ultimate wellbeing. It’s a thought worth thinking as, after Yom Kippur, we emerge from days of focus on the Divine as forgiving Father immediately and seamlessly into days of preparing for Sukkos, paying heed, as commanded, to the myriad technical and exacting laws of the “four species” and the sukkah – laws based, of course, on the 13 hermeneutical principles of Rabbi Yishmael. This entry was posted in Holidays, Jewish Thought, Sukkos on October 11, 2009 by Rabbi Avi Shafran. 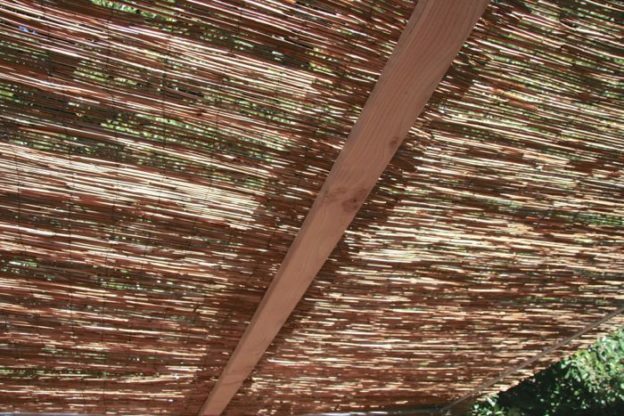 The defining element of the sukkah is the once-growing but now detached material that must comprise the structure’s roof. Some use untreated bamboo canes; others, mats woven for the purpose from slivers of the same material; others still, branches or leaves or thin, unfinished wooden slats. Whatever its particular identity, the s’chach takes its name from the Hebrew word meaning to “cover” or “hover”; the word sukkah itself refers to the same. But there is another Hebrew word associated with the word sukkah – “socheh” – and its meaning is “to see” or “to perceive.” That association would seem to imply that a sukkah somehow provides some perspective. Which, in fact, it does. That is surely true on a mystical plane, but there is prosaic vision to be gained no less. It doesn’t take inordinate sensitivity to see things a bit differently while spending a week in a small rudimentary hut, within sight of, yet apart from, one’s more comfortable, more spacious home. One realizes quickly, for example, how dependent one is on “the elements” – which, in Judaism’s teaching, means on G-d’s mercy. The house is nearby, and if it rains hard enough one can – indeed should – return to surer shelter. But the lesson remains, because homes aren’t impervious to disruptions either, as we have witnessed all too often of late. Nature is a humbling force, or should be; that is certainly part of the perspective granted the sukkah-dweller. But there is more. What the sukkah allows those within it to perceive, if they try, is that our homes and possessions are not what really matter. That ultimately, it is not, as the crass bumper sticker has it, “the one who dies with the most toys” who “wins.” When we sit in our primitive week-house, we come to know that the accumulation of stuff we consider important is not essential. We can exist without it. It does not define us. We will not take it with us. It may seem an odd thing to say, but that thought is a joyous one. Sukkos has simcha, joy, as its theme. In our prayers on the days of the holiday we reference not “freedom” as on Pesach, nor “the giving of our Torah” as on Shavuos, but, simply, simchaseinu, “our happiness.” One might assume at first thought that depriving oneself of the comforts of home is anything but a road to joy. But one would be wrong. Need we look further than the possession-endowed of whom we may have heard – the entertainers, sports figures, best-selling authors, the old-moneyed and lottery-winners alike? They may zip around in Lamborghinis but their happiness quotient is no greater than that of those who take the bus. Their grand estates are no more of a home (and all too often considerably less of one) than the simplest, cozy cottage. In the end, dependency on having as the means to fulfillment dashes all hope of truly attaining the goal. Because true joy comes from things more rarified than what we can buy. It comes from our relationships not with things, but with other people – parents, spouses, children, friends, neighbors – and our relationships with our community, and with the Creator. And so, a deeper perspective afforded us by the sukkah may lie in the realization that, ultimately, what we really have is not what we own, but what we are – to other people and to G-d.
And so, while countless Jewish eyes will soon gaze up at bamboo slats, leaves and branches, they will in fact be seeing far beyond. This entry was posted in Holidays, Jewish Thought, Sukkos and tagged Sukkos on October 11, 2008 by Rabbi Avi Shafran.